Question: What is the earliest that Natural Sea Sponges have been used? 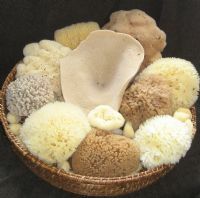 Answer: Natural sea sponges have been used for more than 2000 years. Question: How old are Natural Sea Sponges? Answer: The earliest known multi-celled animal fossils are sponges from China that dates back to about 500 million years ago. Question: What are the earliest mention and uses of Sea Sponges? Answer: The Greeks and Romans used sponges for padding their helmets and as a bath accessory. They were also used for general house cleaning. Frescoes of prehistoric cultures in Crete show images of sponges. They are also mentioned in the Bible and medical texts for the fifteenth century describe their use in the cleaning and bathing of wounds. Question: Are Natural Sea Sponges a renewable natural resource? Answer: Scientists found that regular harvesting actually improves the physical state and population of sponges. During harvesting care is taken not to disrupt the natural balance of the environment. Question: Do you get natural sponges in fresh water? Answer: Most sponges live in salt water; only about 150 species live in fresh water.So far scientists have identified about 5,000 different species of sponges - all colours, forms and sizes. Question: How many Natural Sea Sponge types are there? Answer: Only about 7 sponge species are commercially viable. These are known as tame sponges. Tame sponges are wide spread in temperate sub- tropical and tropical water around the world. Question: Are Sponges classed as animals or plants? Answer: Natural Sponges are classed as animals. Until 1765, sponges were considered as plants, but naturalist John Ellis proved they were actually animals. A sponge does not have a brain or a central nervous system; in fact sponges have no heart, brain, head, mouth or any other body parts and have many plant like qualities. With the exception of the single - celled animals, the Protozoa, sponges are the simplest animals in existence today. Question: What is the scientific name for natural sea sponges? Answer: The scientific name for sponges is Porifera. Question: How do natural sea sponges grow in the sea? Answer: Sea sponges live on the ocean floor. They attach themselves permanently to something solid and move sea water through their bodies. Question: How do natural sea sponges live and grow under the sea? Answer: A sponge has thousands of pores which let the water flow through it continually. They filter tiny organisms and plankton for food and nutrients from the water. The flowing water also carries out waste products. It is these deep pores that enable a sponge to hold such a tremendous amount of water. Question: How do natural sea sponges reproduce? Answer: During reproduction each adult can act as either the female or the male. In most species fertilisation is internal. When sperm is released and floating in the water it is caught by another sponge's collar cells. Fertilisation of eggs takes place inside the sponge. A tiny larva develops and is released. The larva uses tiny hairs to propel itself through the water and eventually attach itself to a solid object to grow into an adult sponge. Sponges are only able to produce eggs after three years. Question: Can a cut up sponge grow again? Answer: Some sponges are able to regenerate themselves, from even the smallest root left after harvesting. If a sponge is broken up into tiny pieces the pieces will grow into clones of the parent sponge with exactly the same DNA as its parent's DNA. If you were to put a "live" sponge in a blender and blend it up and put the blended up sponge back in the sea, they would come together to form a new sponge. Question: Do natural sea sponges become yucky like artificial sponges? Answer: Natural sponges also inherently have anti-microbial and anti-bacterial properties. Because water is easily flushed through it, it is easy to keep your sponge clean and free from harmful contaminants. Question: Why are some sea sponges yellow and some brown? Answer: The majority of sponges are cleaned, processed and bleached to an attractive golden yellow colour but some are unbleached and they have a natural brown colour. Question: How are natural sponges processed? sponge suppliers take great care to remove all foreign matter from the harvested sponges. Question: Are natural sea sponges chemical free? Answer: All sponges have to pass through a chemical treatment even if they are not going to be bleached. For instance, Hydrochloric acid is used to eliminate stones, see weed, shells and plant remains because it would not be possible to clean the sponges thoroughly for commercial use without this step. Question: Are harmful chemicals used to clean and bleach natural sponges? Answer: All chemicals used are safe and environmentally friendly and recyclable. In the 1860's the sponge business was given a boost with the invention of the standard diving suit, called the skafandro. This suit allowed divers to stay under water for much longer periods and dive down to deeper depths to harvest larger and better quality sponges. Unfortunately, this suit also had a devastating effect on the divers because many developed decompression sickness and numerous divers were paralysed or died as a result in the first year of its existence. Figures of 10,000 deaths and paralyses of 20,000 divers have been recorded and the use of the suit was temporarily stopped. Recently Dr Jef De Brabander, Associate Professor in biochemistry at UT Southwestern Medical Center Dallas, Texas and his colleagues identified and synthetically recreated a chemical compound from a sea sponge that could one day act as a chemotherapy agent against cancer. The chemical found in the marine sponge Haliclona found off the coast of Australia seems to be exactly what cancer researchers have been looking for but the sponge is extremely rare. Toxic chemicals created by millions of years of evolution are a sea sponge's only defense system against marine predators. Scientists discovered many years ago that sea sponges might be among the best natural drug sources in their battle against cancer. Although a cure is still many years away, Dr De Brabander says "There are only a few molecules that come along every year that researchers get excited about. This is one we really took notice of." Sponges use chemicals to prevent other sponges from growing near them. These chemicals keep cells from growing. It also helps to keep its own body free of harmful parasites. In 1994, a "predatory" sponge was discovered in a Mediterranean cave near Marseilles , France , this sponge actually covers its prey and then consumes it. It has no brain, no heart, no stomach, no muscles--yet it is a voracious killer all the same. Luckily it is barely larger than the average thumbnail. Sponges drink the equivalent of 64 glasses of water each day. Scientists once found 17,000 creatures living in one glass sponge. Tiny shrimp, polyps, shellfish and fish may live their entire lives inside a sponge. They not only feed well but are also concealed from predators, apparently without harming their host. Sponge crabs tears off bits of sponge tissue and hold it against their hairy backs until the bit becomes fixed in place. The sponge starts growing larger and larger and tiny creatures move in. It provides excellent camouflage for the crab, while the sponge gets a free ride to greener pastures. Some elephant-ear sponges are large enough to fill an average bedroom. Using time-lapse photography, biologist Calhoun Bond at Greensboro College in North Carolina has discovered so far that 10 species have the ability to crawl. "Many, many cells will crawl together so that the whole margin of the sponge is moving," he says. Sponges only move a few millimeters a day. As it creeps, the creature rearranges its shape and internal structure, cell by cell. "Wounded sponges just rearrange themselves. Sheets of cells moving together can close a wound in a matter of days." One of the glass sponges, the graceful cloud sponge, found off the coast of Vancouver Island consists mostly of an enormous single cell with countless nuclei that is stretched over the sponge's skeleton like chewing gum in lots of different directions. Scientists found evidence of electrical signals moving along the overall cell membrane and because it's all one cell, when you touch one end, you're actually touching the whole animal.